While Marek Hamšík's ascend to the world of top class football was gradual, with a stop-over at the Seria B side Brescia Calcio, winger/attacking midfielder Miroslav Stoch found himself near the summit before he reached the age of 17. A decent amount of technical skill combined with young Stoch's drive towards the opponent's goal compensated for his short stature [1.68m/5 ft 6 in] - Chelsea was more than convinced and signed the youngster, who was to become the pride of Chelsea's Youth Academy. The story, however, did not stop there. Stoch's early days seem similar to those of young Marek Hamšík - a football-crazy kid that dedicates his childhood to the game, turns up for every training session early and leaves late in order to practice dribbling and shooting on the goal, plays with his friends whenever he is at home. Young Stoch's efforts bore fruits and he quickly became FC Nitra's shining prospect. Following his hat-trick in an U-17 match against ŠK Slovan Bratislava just a couple of weeks before his 16th birthday, "Miňo" earned a promotion to FC Nitra's A-team as soon as he reached the "legitimate" age to play in Slovakia's top league [16 that is]. Stoch was soon trialed by OGC Nice, but received an offer he could not have declined once the trial was over. "Playing out wide or behind a front player, he's a quick and tricky, two-footed and good in one- v-one situations. A Slovakian international who is joining us this season, Miroslav is a good goalscorer." 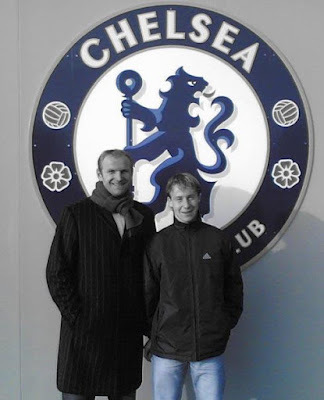 - such was the assessment of young Stoch as he joined Chelsea's Academy in July 2006 by Neil Bath, its manager. Stoch did not disappoint, became the U-18s top scorer with 11 goals in the 2006/7 season and earned his place in the reserve team the following season. He scored two in 10+3 games for the reserves and made 14 appearances for the youths, with a solid record of 10 goals. "It is clearly laid out in our long-term planning for 2004 to 2014 – after which we aim to be self-financed – that from 2010 and onwards our top priority is to introduce one player [per year] into the Premiership squad. ... It was never the objective that I should be delivering two talents for the best team from 2007 on a yearly basis ... You don't create talents at the assembly line. Patience is a virtue. In a top club like Chelsea you do not waltz into the team at the age of 18-19 years." It was becoming that that if Chelsea's young stars were to shine, it must have been outwith Stamford Bridge - albeit for a limited period of time. In the summer of 2009 Chelsea sent its most prospective young players on loan - Di Santo to Blackburn, Mancienne to Wolves and Stoch joined FC Twente, a Dutch Eredivisie side managed by Steve McClaren, who was exiled to the Netherlands in the aftermath of his failure to qualify for the Euro 2008 [ask England fans for a story or two]. "Miroslav is probably the sensation of the Dutch League this year", said Frank Arnesen in his recent assessment of Chelsea's on-loan players. FC Twente is currently sitting on top of the Eredivisie and has yet to be defeated - very decent effort from a side that has failed at all 48 efforts to win the competition [although came close last season, finishing 2nd]. Steve McClaren is picking up the pieces of his shattered reputation and putting them quickly together, with many British media not quite knowing what to make out of the man and his club. Stoch has formed a prolific partnership upfront with the Swiss veteran N'Kufo and Costa Rica's Ruiz who is currently chasing Ajax's Luis Suarez, with the former scoring 13 goals in 17 games and the latter finding the net on 18 occasions [wow!]. Stoch has impressed with his speed, dribbling skills and great shot. He, however, took his time to get into goal-scoring form, something that he attributed [in an interview for chelseafc.com] to playing on the right hand side as opposed to his favourite left-hand side. Goals started to fall in once McClaren put him on the left - he scored a double against Heerenveen in September, single-handedly securing Twente's 2-0 triumph. "Miňo"'s first goal for Twente came after he managed to fool three opponent's players; his second after a long ground pass from Ruiz - Stoch was too quick for two Heerenveen defenders and hit the ball well despite losing his balance. Stoch had to wait for his third goal over a month, but the goal [against Groningen] was worth the wait - a splendid shot from outside the penalty area that even the keeper failed to reach. Roda Kerkrade - another week, another goal - Stoch made yet another classy run only to finish from about 11 yards out with an even classier shot. Six days later he shot the Sheriff by getting a double - the first one from a perfect pass from a Sheriff, the second in a manner reminiscent of his Groningen goal. Four more goals followed - against Tilburg in late November, against Nijmegen in early December [another long range shot] and, most memorably, another double - this time against NAC Breda. Young Stoch showed a healthy dose of confidence after converting a penalty - a la Panenka; his second goal was sheer excellence. "Miňo" has summed up his half a season in Twente in an interview for Chelsea's website - "I can say I am happy", said Stoch. And so he should be - the buzz among Chelsea fans is substantial. Miroslav Stoch is, despite his young age, a key member of Slovakia's team - most fans hope that his current goalscoring record for Twente [8+2] will be extended in the second half of the season and, most importantly, in South Africa. Stoch's place in Slovakia's starting XI is more or less secure - his qualities cannot be overlooked. His speed, shooting and dribbling will come handy; his ball control and crosses are equally good, just as his agility. Stoch's lack of defensive skills might be his Achilles' heel - as an offensive midfielder he tends to forget to make it back on time and help out, something that more than numerous Slovakia's opponents exploited in the past. The big question is whereto next - McClaren's weapon of choice is a 4-3-3 formation, Ancelloti relies on a 4-1-2-1-2 "diamond" - if Stoch returns to Chelsea for the 2010/11 season, [where] will he play? If not, will Chelsea extend his loan in a league that has provided invaluable playing experience to so many top class players? Will he be loaned to another Premiership side? Will he be sold? Regardless of the answer, I am sure that this is not the last time you are hearing about Miroslav Stoch, one of the "Three Young Hopes of Slovakia".